low cost, simplicity and reliability. The light commercial market is largely under served by HVAC automation. DDC systems often are too expensive and too complicated for these users. These users have more in common with the Do-It-Yourself customer than the large building customer, yet stand-alone thermostats don’t provide the efficiencies nor ease of use of an automation system. Light commercial covers a broad range of small facilities. It includes fast food restaurants, many standard restaurants, small office and medical buildings, automobile dealers, large churches and others. What they have in common is that there is no HVAC technician on site yet they want control over their system. The “system operator” might be the owner of the facility, an administrator, a church volunteer, a maintenance person or someone else with many other responsibilities and no training in HVAC operations. Consequently, the key characteristics of an HVAC automation system for this market are low cost, simplicity and reliability. Low cost includes low purchase price. Low purchase price means the equipment to be installed is small and simple. With today’s electronics, the memory, processors and networking are simple and inexpensive while keyboards and displays can be bulky and expensive. Users are familiar with the Internet and web browser so building a simple web server into a small on-site unit enables use of the web browser to replace expensive dedicated displays, keyboards and touch panels. Plus, remote access is built-in. However, a small inexpensive unit on site can’t store all the data needed for trending and longer term diagnostics. An Internet based server provides the storage and database system to support these functions while serving multiple sites to reduce cost. Low purchase price needs to be coupled with low support cost. This means, among others, that trips to the site for trouble shooting need to be eliminated as much as possible. With today’s widely available networking, including the Internet, remote access to the on-site unit enables the system installer / provider to do remote diagnostics so unnecessary site trips can be avoided and those that can’t be avoided are as productive as possible. Simplicity and low support costs go hand-in-hand. A system that is simple enough for the user to operate, and to remember how to operate, reduces calls for support and the expensive technical manpower needed to answer these calls. The most common thing the user does is to change the temperature at a thermostat. But, without going to the thermostat. The web browser provides a convenient way to do this with which most users are familiar. 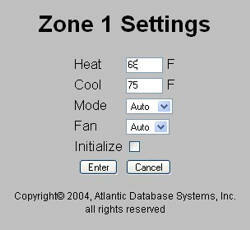 Here the thermostat label “Zone 1” is a familiar link which users know to click for more information. 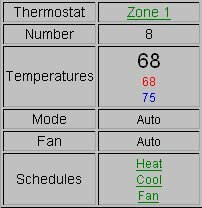 A simple “control panel” contains the thermostat settings in a form most users have encountered before on the Internet. Changing the current settings for the thermostat is a simple manner of filling out the form and clicking Enter. One of the purposes of the HVAC automation system is to assure that thermostats are set back when the facilities are not in use. 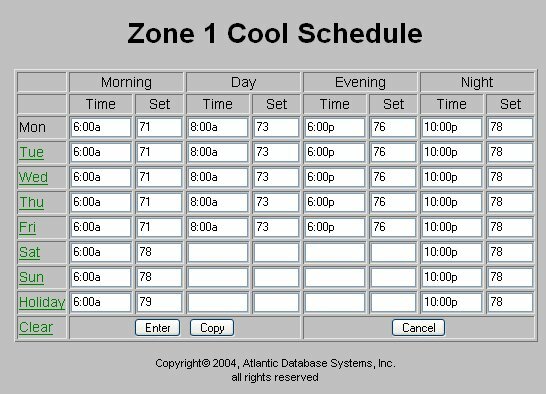 A click on, for example, Cool brings up the cooling schedule for the thermostat. The spreadsheet style form provides a method for entering the schedule to which many already are accustomed. Each slot in the schedule contains the time of day and the temperature to go into effect at that time. It’s common for the schedules to be the same, or at least similar, throughout the week. To simplify entry of the schedule, clicking a day on the left side of the form copies the schedule from the day above. Reliability includes not only equipment that doesn’t fail often but also a system in which a failure in one part doesn’t affect other parts and in which it’s pretty easy to tell what has failed to avoid finger pointing among various venders. Solid state electronics are very reliable. Failure is more common in moving parts like hard drives and keyboards. Customers are not aware of it but we use Linux in our units to combine ease of development with high reliability. This means, for example, that a unit simply can be unplugged and then plugged back in again, like a toaster, without further action on the part of the customer. A so called “single point of failure” can be avoided by separating the components into thermostats, the on-site electronics, a network and user PC’s. Now, should the on-site electronics fail the thermostats still keep the temperatures from getting too hot or too cold. A failure of one thermostat is easy to identify and doesn’t affect the temperature at other thermostats. The user interface isn’t lost if a PC is unavailable. You just move to a different PC and use the web browser already on it. A somewhat more complex situation can occur, and often does, in which the area is too hot or too cold. Is the problem with the thermostat, the air handler or something else? The installation of a temperature sensor in the output duct of the air handler serves to help identify the problem. Is the room cold but the thermostat isn’t calling for heat? Check the location of the thermostat. We’ve seen thermostat mounted directly over a large copier and behind a computer monitor, both heating the thermostat. Is the thermostat calling for heat but the output duct is at ambient temperature? Check the air handler and the wiring between the thermostat and the air handler. Is the temperature in the output duct, say, 90 degrees but the room isn’t warm? Check the fan in the air handler, the air flow or for an open door. Trending data can help identify other problems. A bar chart showing the time each air handler was running helps identify units with low pressure, undersized units or thermostats in the wrong location. Units which don’t bring the room temperature up to the set point rapidly can identify a problem. Here the air handler wasn’t heating the room even though the thermostat was calling for heat. Email alerts identify out-of-variance conditions, often before the customer is aware a problem exists. Alerts for temperatures that remain above or below the set point are generated automatically. Custom alerts identify, for example, a freezer that has failed in time to save the contents. Customers in the light commercial market need low cost, simplicity and reliability. This article describes methods by which these can be met. Low cost means not only low equipment and installation costs but also low support costs. Customers want to control their own thermostat settings to give them control and reduce costly calls to the installer. Installers want a system that’s easy to sell, easy to install and doesn’t need expensive callbacks to fix. Low cost and simplicity can be provided by keeping the system electronics simple and by using the familiar web browser as the user interface. Most customers know how to use the web and to fill out forms. Reliability means parts that don’t fail and also a system in which a failure of one part doesn’t, for example, keep other areas from being heated. Dividing the system into small, simple parts reduces costs and improves reliability. The right information can make the system seem simpler and more reliable to the customer because problems can be identified, explained and fixed more easily. A sensor in the output duct helps identify whether the air handler is running when it should be and whether it is working correctly. Other diagnostic methods can require more storage than is available in a small, low cost unit on site. 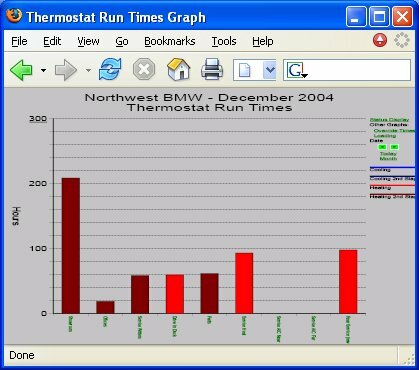 The Internet and a database server provide trending data and graphical displays to more easily spot problems. Remote access via the Internet to the on-site unit enables the service provider to run diagnostics, to identify problems before going to the site, to eliminate some service calls and to be prepared for service calls that can’t be eliminated.